In anticipation of Dr. Christophe Randin’s keynote speech to LAS’s first GLOBE Day Science Fair on Monday (16 March), I visited him at the “Musée et Jardins Botaniques Cantonaux” (Botanical Gardens) in Lausanne, where he works. We explored many exciting collaborative opportunities, including the possibility of Dr. Randin becoming a visiting scholar at LAS through LASER. Dr. Randin will share stories about the ecology and climate change in the mountains around Leysin, where he has done extensive research for more than a decade. His short talk will begin at 18:00 in the Savoy Library and finish by 18:30, including a question-and-answer session. He’ll stay afterward to talk with faculty involved in the GLOBE Program at LAS. Earlier, from 16:30 to 17:30, Mr. Dan Patton and Mr. Chris Leonhard’s classes will present their science posters in the Savoy Library. This year’s conference is our first GLOBE Day, providing good practice for much bigger events planned for future years. This place is seriously impressive. Everyone interested in plants and local ecology should visit it. In addition to the outside grounds, Randin showed me the herbarium with its million-plant collection (which Randin is responsible for curating). It’s the third largest in Switzerland and the 10th largest in Europe. The Botanical Garden is on a peninsula built of morainal rocks delivered here from the central Alps during the ice age (from as far away as the Matterhorn and further east). Chestnut trees thrive here that would not be able to grow on the local limestone-based soil. We hope to bring LAS students here in spring or fall. 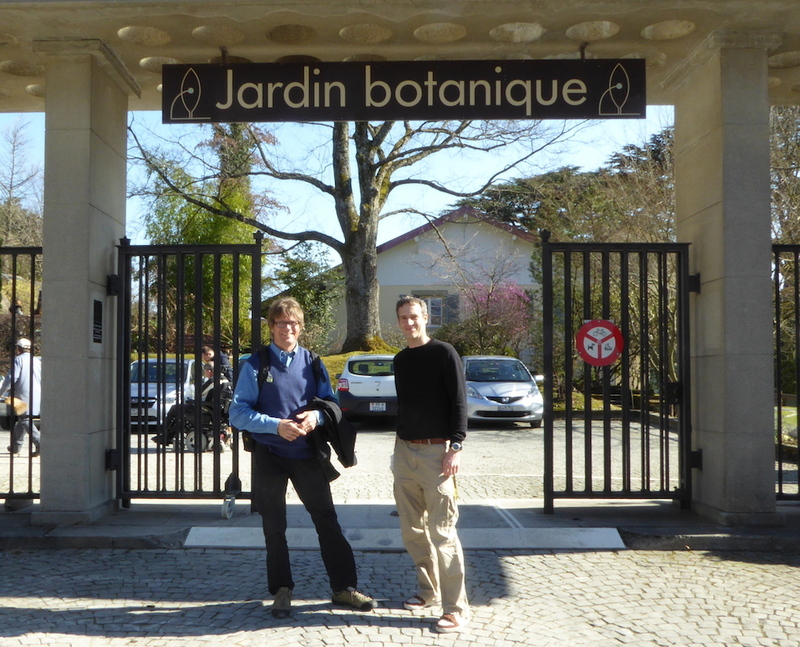 Chris Randin (right) and John Harlin at the entrance to the Lausanne Botanical Garden. We also discussed student field trips to the Pont de Nant Botanical Gardens in Bex (on the other side of Villars, under the Grand Muveran), which is devoted to native alpine flowers and will be more relevant to our Leysin ecological studies. The garden celebrates its 125th anniversary in August, making it the oldest still-operating botanical garden in the Alps. 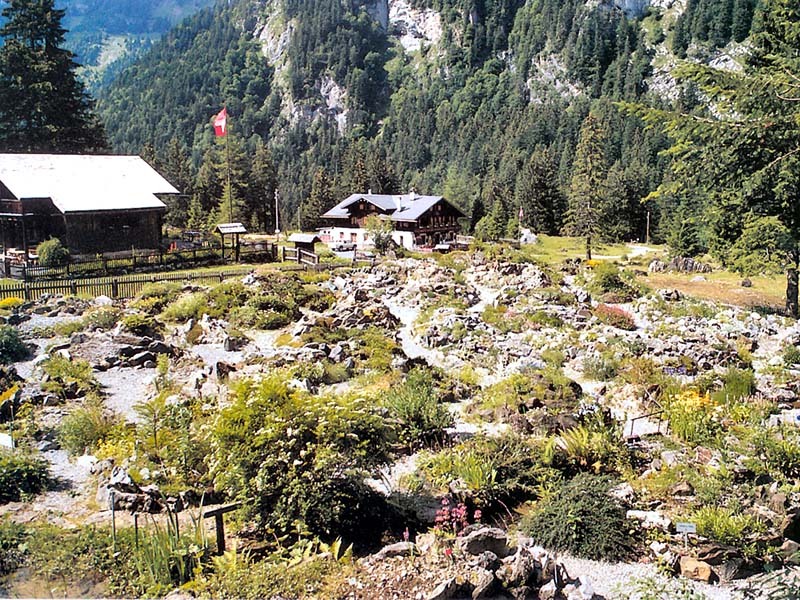 The alpine botanical garden at Pont de Nant. Dr. Randin invited LAS students to help collect seeds from Alpine plants this coming September and October in the region around Pont de Nant. We can be trained in seed collection, after which we can collect more seeds in the Leysin region for our own gardens at LAS. In addition to the plots we’ve already established at different altitudes all the way to the top of the Tour d’Aï, Dr. Randin suggested that we study plots right here on grounds owned by LAS. Best will be to study fields that have not been grazed, fertilized, or otherwise manipulated other than mowing. This will give us some great research opportunities right on campus. From his experience with CREA (the Alpine Ecosystems Research Center in Chamonix), Dr. Randin knows a lot about working with students as citizen scientists. He feels that older students can gather very important data and that we have a marvelous opportunity to introduce young students to real science and then help them grow into genuine amateur scientists by the time they graduate. A lot of good work can be done simply with a camera and a measuring stick. The directors of the Alpine Ecosystems Research Center in Chamonix (CREA) will visit LAS this spring to tour our grounds, discuss research and education here, and teach us about local plants. We’ll keep everyone updated about this exciting visit. We are excited that Dr. Randin is a visiting scholar at LAS (via LASER), which means that he will come here regularly to do research, help us with our own research and education, and generally build an ongoing professional relationship between himself, LAS, the Botanical Gardens, and the University of Lausanne, where he also works. Dr. Randin pointed out how it is very difficult to distinguish the effects of climate change when there is also a change in human use of the land (cows, sheep, etc). But this opens opportunities for students, as we can interview today’s farmers about how they use the land differently from how their grandparents did. We are discussing cross-disciplinary studies, where geography classes can collaborate with French and biology classes so that together we explore all aspects of our local Leysin ecology. Dr. Randin and I share a passion for places that have never been affected by humans. The rare examples of this in the Alps are places where cows and sheep can’t graze and loggers can’t reach–usually cliffs and other steep places. Dr. Randin has researched plants growing along the via ferrata on the Tour d’Aï. There are many undisturbed places quite close to LAS where we will combine a little adventure with important science for LAS students. We also discussed building weather stations that communicate back to LAS via cell phones, “bioboxes” that reproduce alpine environments in the classroom, and other teaching opportunities that yield genuinely useful science while building strong relations with regional institutions. We think we’re pioneering a new type of research-based education where we can learn science by doing science. All of us have a lot to learn, not only about the local ecology, but also about how to make all this work best for LAS students. If this excites you as it does us, please join us in exploring our Alpine horizons. Contact Chris Leonhard, Dan Patton, Paul Magnuson, or myself. And please check out some of the links listed below.